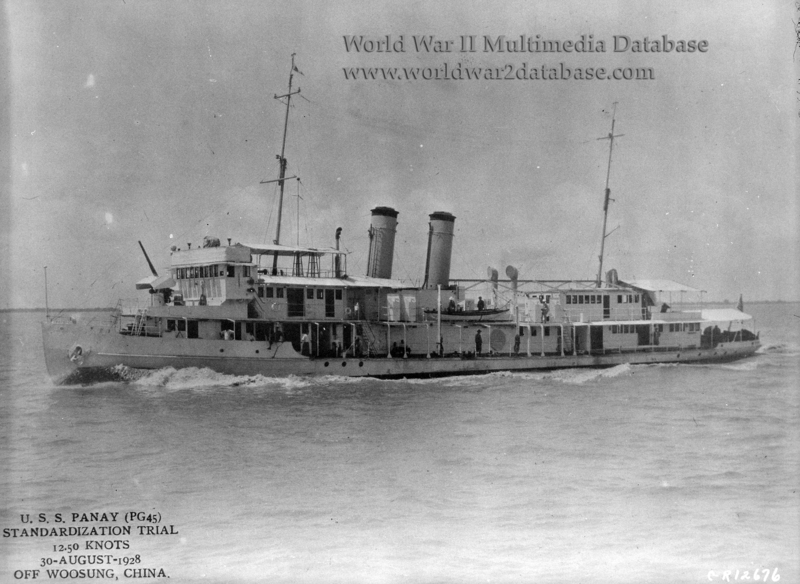 USS Panay (PG-45; later PR-5) during builder's trials making 12.5 knots (14.3 miles per hour or 23 kilometers per hour) on the Yangtze River off Woosung, China, on August 30, 1928. One of the few American warships built in a foreign country, Panay escorted American ships and Chinese-owned ships working for American interests. On December 12, 1937, Panay was escorting three Standard Oil tankers (SS Mie Ping, SS Mei Shia, and the SS Mei An) away from the battle for the city of Nanjing. Civilians, including the American consul staff and American and Italian journalists, were on board. at 1337 Hours Imperial Japanese Navy Mitsubishi A5M Type 96 carrier-based fighters, Nakajima A4N Navy Type 95 Carrier Fighters, and Aichi D1A2 Type 94 Japanese Carrier Dive Bombers in v-formations began dive-bombing, level bombing, and machine-gunning. The first bomb strike hit the pilot house, incapacitating USS Panay's Captain, United States Navy Lieutenant Commander James J. Hughes, knocking him unconscious. Lieutenant Arthur F. Anders took command and ordered the ship to defend itself with the two 3-inch (76 mm) guns and eight .30 caliber (7.62mm) Lewis guns, but the Lewis guns, mounted for fighting river bandits, could not be elevated to reach the high level bombers and could only attack the dive bombers as they pulled out of their dives. After 20 minutes, the ship was sinking; communications and the forward 3" gun were out of action. Anders wrote "abandon ship" in his own blood and supervised the evacuation of the passengers and crew. The standard oil tankers were beached or sunk; Mie An's Captain Carl H. Carlson and several of his Chinese crew were killed. Aboard Panay, Storekeeper First Class Charles L. Ensminger, Lieutenant Edgar G. Hulsebus and Sandro Sandri, an Italian journalist, were killed. After hiding on shore while Panay sank, the survivors trekked overland and were picked up by HMS Bee, HMS Ladybird and USS Oahu at Hoshien and taken to Shanghai. There, survivors transferred to USS Augusta. Japan paid $2,214,007.36 for the loss of the Panay; officers got $514 and Enlisted Men got $210 for their possessions lost.